Horror is an odd bird. As much as the genre gets unfairly maligned for quality reasons, it does, admittedly, squeeze out more hack sequels than any other cinematic subset. Take Annabelle for instance, the quick, slapdash cash-grab of a prequel to James Wan’s The Conjuring. It’s not particularly egregious, just bland and uninspired. As opposed to The Conjuring 2, the proper follow-up, where the filmmakers took their time and made a movie that’s actually good, some may argue better than the first. 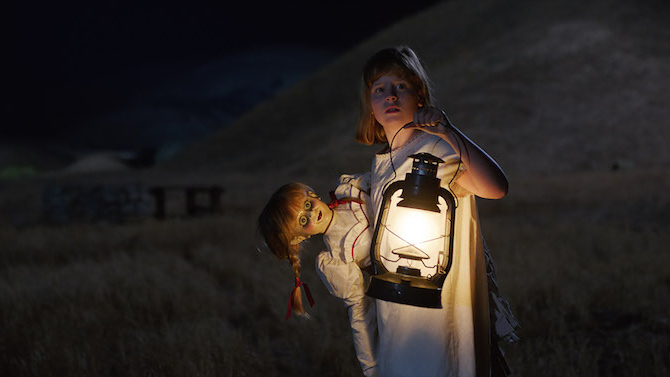 All of this adds up to many folks being surprised that Annabelle: Creation, a prequel to the prequel, is actually a solid horror joint. Overlong by about 20 minutes, without a whit of originality to speak of, and ultimately forgettable, director David F. Sandberg follows up last year’s Lights Out with another perfectly serviceable studio creeper. There are no surprises to be found—when the camera lingers on a doll face, you know it’s going to turn or blink; when the lens peers into the darkness, something is obviously about to leap, reach, or otherwise grab from the shadows—but it’s an entertaining and suitably scary outing. Beyond sinister dolls, Creation overflows with flickering lights; a giant, creaky old house; orphans (I’ve never understood why kids without parents are creepy, but…); religious imagery; an eerie shed; and you just know right away that the automatic chair lift that goes up and down the stairs will come into play eventually. Still, working within familiar confines and near drowning in well-worn tropes, Sandberg largely delivers. None of these elements feel fresh, but he uses them well and creates an atmosphere of tension and dread, liberally sprinkled with jump scares. There’s a reason these tools have become so ubiquitous, because when used by someone who knows what they’re doing, they’re quite effective at delivering scares and frights. Creation proves why all of these pieces endure, and Sandberg certainly demonstrates he’s efficient at sending chills up your spine and getting the old pulse pounding when necessary. 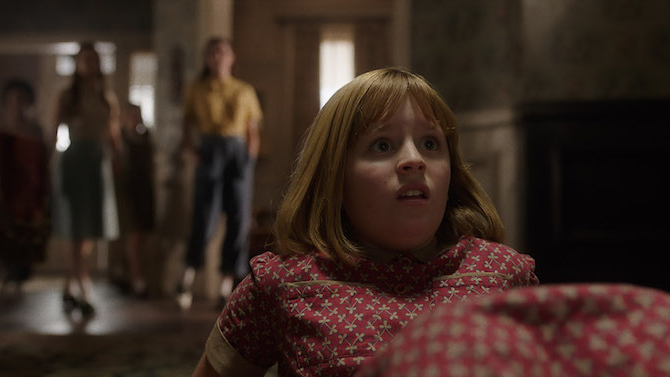 As the title suggests, Annabelle: Creation is an origin story. The set up never veers from the standard horror track. Overall, and even moment to moment, the plot plays out entirely as expected. We look back years before previous installment, hopping from the late 1960s to the late ‘40s/early ‘50s. 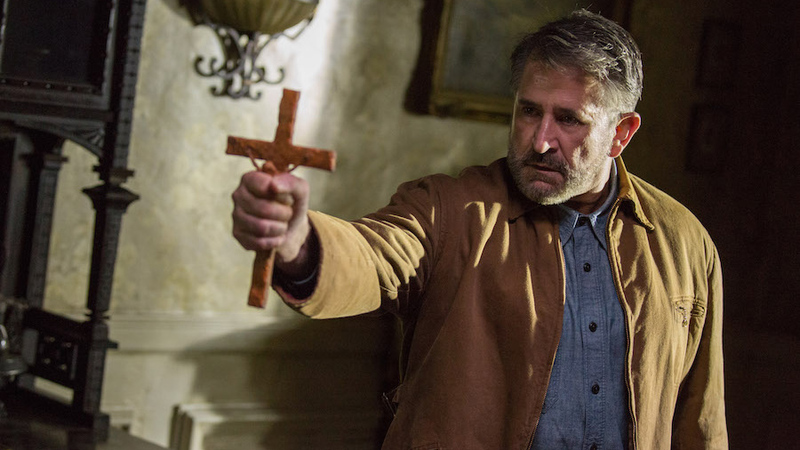 After losing their young daughter in a tragic accident, a dollmaker and his wife (Anthony LaPaglia and Miranda Otto) take in a group of orphaned girls and their former Bond girl nun overseer (Stephanie Sigman) at their massive, isolated, super spooky house. Before long, the girls become the target of Annabelle, the possessed, malevolent doll audiences first met in The Conjuring. The biggest flaw is that there’s simply too much going on. At first, the focus falls on Linda (Lulu Wilson) and Janice (Talitha Bateman), two BFFs, one of whom suffers from from polio and wears a heavy leg brace. This is where the story’s true strength lies. The girls have a solid, if overly cutesy bond, and when Gary Dauberman’s script puts them in harm’s way, it’s effective horror 101. 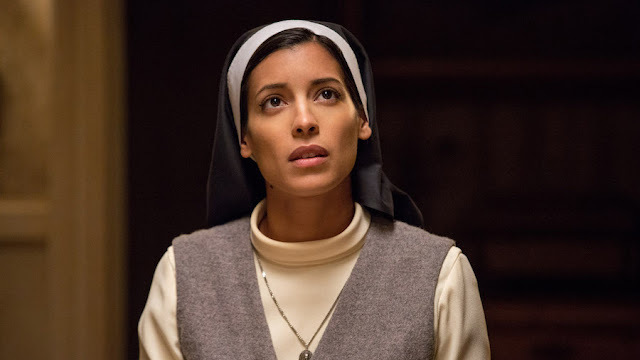 But Creation also spends time with a group of older orphan girls, with LaPaglia and a half-mask-wearing Otto, with Sister Charlotte (Sigman), all to diminishing returns. Because the script tries to do too much, everyone gets the shaft. A clear protagonist never emerges, and the result is scattered and spools out instead of staying tight and lean and laser focused. While it could have been a compact, efficient 90-minute horror romp, it clocks in at 109 minutes. It doesn’t feel bloated exactly, but the narrative is disjointed and rambling instead of streamlined. Everything else is fine. The story is fine, the atmosphere is fine, the acting is fine…you get where I’m going. Nothing stands out, but it’s—say it with me—fine. This was never destined to be much more than another creepy doll movie. Filmed by Maxime Alexander (Haute Tension, The Hills Have Eyes), it looks fantastic, but there’s little else to set it apart. But that doesn’t mean it’s bad. In fact, it’s about as good a movie as possible with these pieces—Sandberg again shows he has a solid grip on the genre and an eye for what makes it tick, even if it needs to be trimmed and shaped.